10:00 PM Tonight to 12:00 AM Friday Morning. Good Afternoon from Christianwebhost! I hope everyone is doing well today. We will be preforming maintenance on your server Thursday, January 31, 2007 beginning at 10:00 PM EST. This maintenance will upgrade the firmware on your server and improve stability. The upgrade cannot be performed on-line and will require an estimated 2 hours of downtime. We have preformed many of these on other servers and do not anticipate any issues. Start Date: Thursday, January 31, 2008- 10:00 PM EST Window End Date: Friday, February 1, 2008- 12:00 AM EST * Impact: The following server host22.christianwebhost.com will be taken off-line during the maintenance window: * Reason for Maintenance: SUN blade firmware upgrade * Risk mitigation: Before the upgrade, we will be performing a full backup of your server. Thank you so much for your patience and if you have any questions, please post at the helpdesk and we will be happy to help. Thanks for the post, Orion. LAWL!!!!! It's that cat pictures! I love those things! Even the one stealing your internets? 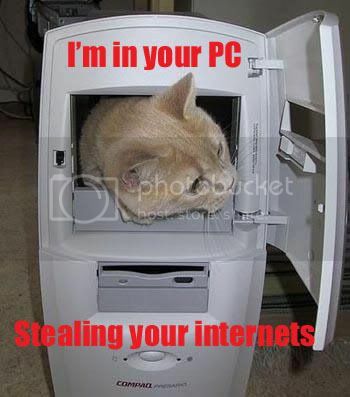 Well maybe not exactly stealing my internets...I gotta keep in contact and all...but I still love those cat pictures! LOL! Those are great AC! You people live in a cat house or something. Location: You will never guess. i had seen it all now! Looks like another one for Saturday night. Good Afternoon from Christianwebhost! I hope everyone is doing well today. aware of the maintenance times. Thanks so much! * Risk mitigation: Before the upgrade, we will be performing a full backup of your server.